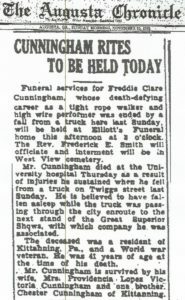 When Freddie Cunningham was born in Manorville, PA in 1893, he was the youngest of 5 children born to Westley and Elizabeth A. (Shaul) Cunningham. His Father was employed as a painter and specialized in painting very high edifices like bridges and coal tipples, etc. 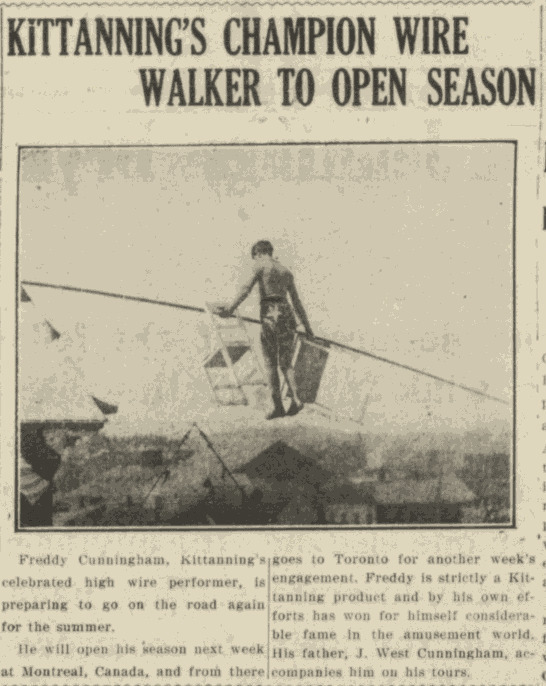 In 1903 at the tender age of 10, he lost his mother. His older sister Armintha was married, as were his two brothers Wesley and Chester. His brother Chester had joined his father in the painting business and when his sister Eva married the following May, Westley out of necessity began to take the young Freddie on the job. The young dare devil became quite adept at climbing the high towers and was fearless when it came to heights. At age 13 he had become renowned as a high wire artist, working with Rutherford Greater Shows. His father accompanied him on his tours. They continued to travel while doing painting work in the off season. In May of 1917 at age 24, Freddie joined the service. He became a Corporal in the 14th U. S. Cavalry and was Honorable Discharged on March 17, 1919. While he was stationed in Texas in October of 1917, his Father and brother Chester fell while painting a coal tipple at Mohawk Mine in East Franklin Township. His Father was killed and his brother seriously injured. 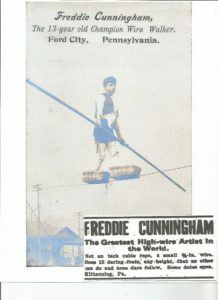 Freddie continued to work the high wire although little is known of when or where. In 1923, he traveled to Havana, Cuba to perform and there met Providenzia Lopez. They married in December of 1923 and traveled between San Juan, Puerto Rico, and the United States, residing in many areas. 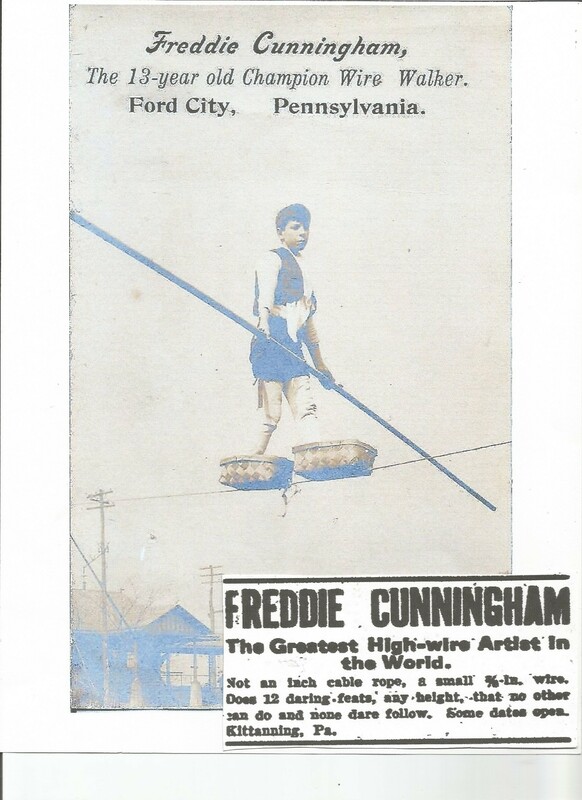 He had added trapeze artistry to his high wire act and was employed by Dixie Carnival Company. 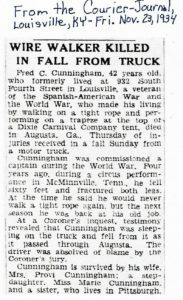 On November 24, 1934, while traveling “over-the-jump”, a term used by carnival workers when traveling between engagements, he fell from the back of a truck as it passed through Augusta, Georgia and was killed. He is buried in West View Cemetery, Augusta, Georgia. 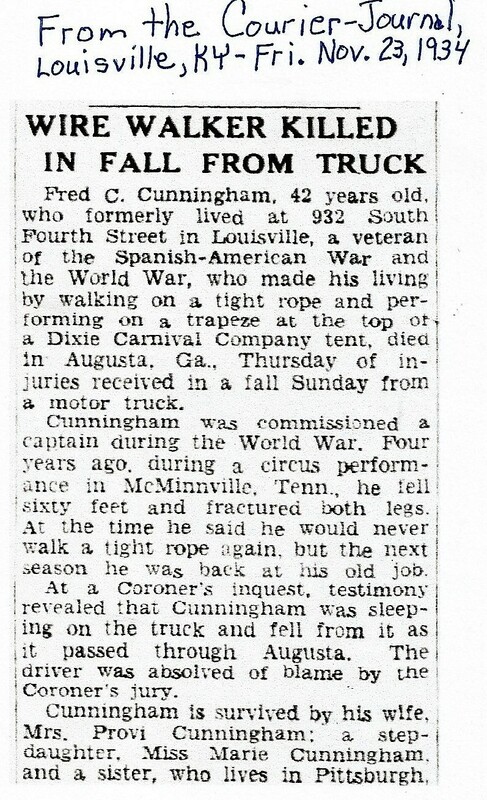 His wife survived him passing away in 1976. 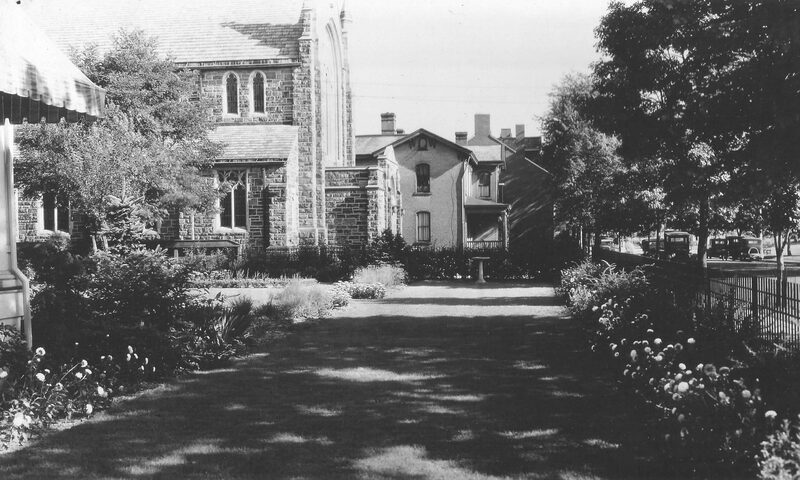 The Rutherford Greater Shows were owned and managed by brothers Harry and Irving Polack. 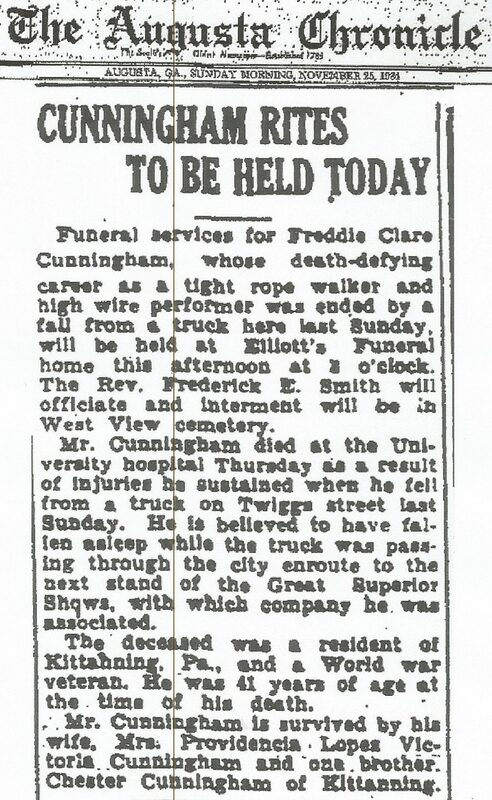 Harry Polack dying in March 20, 1919. Find A Grave #87215265. Irving Polack living until 1949 and dying in California.